If you want to use one of the thematic templates, select "Template". Send pictures for modification of one of ready-to-use templates or graphic files with your own template. Complete information on colours, textual contents and other elements of the template. Choose an option500 pcs.750 pcs1000 pcs.1500 pcs.2000 pcs.3000 pcs.4000 pcs4200 pcs.5000 pcs.7500 pcs.10000 pcs.15000 pcs.20000 pcs.25000 pcs.30000 pcs.50000 pcs. Custom printed paper cups for espresso 8 oz. Our products are very resistant to high temperatures. Consumers can fill cups with hot drinks with no risk of burning their hands. The structure of the cup helps to keep the desired temperature for a long time. Cups can be used for hot and cold drinks. 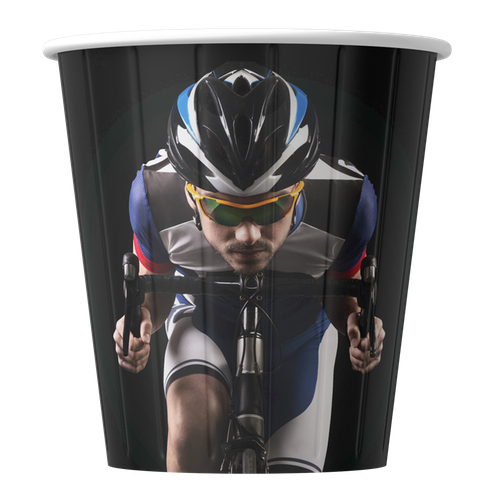 Our cups are covered with high-quality print, which will surely attract consumers and encourage their frequent use. In our production we use packaging materials from leading suppliers that have certificates of safety.Our products are very resistant to high temperatures. Consumers can fill cups with hot drinks with no risk of burning their hands. The structure of the cup helps to keep the desired temperature for a long time. Cups can be used for hot and cold drinks. Our cups with high-quality print, which will surely attract consumers and encourage their frequent use. PRODUCTION TIME 7-14 DAYS. SHIPMENT TIME IN USA AND CANADA 5-7 WORKING DAYS. In our production we use packaging materials from leading suppliers that have certificates of safety.